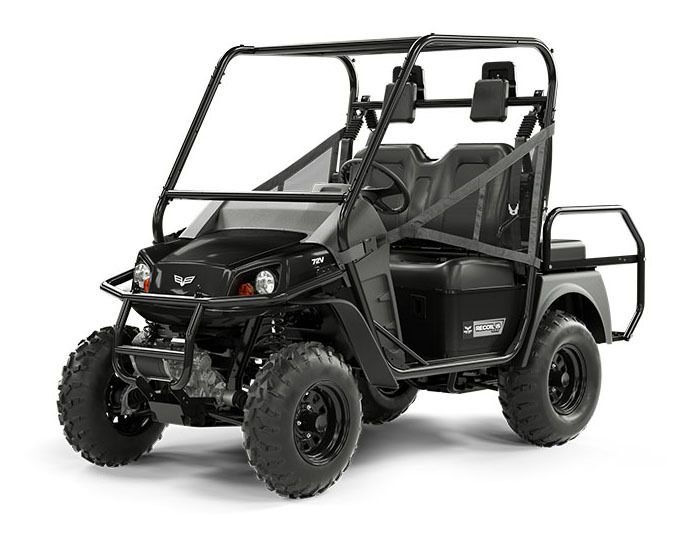 A tenacious electric vehicle that’s ideal for the hunt or the trail. The Recoil® side-by-side's clean, quiet electric power is perfect for riders who don't want to deal with the fumes and noise of gas engines. Upgrade to Recoil iS for four-wheel independent suspension and make the ride even smoother. POWER: Recoil’s drivetrain delivers plenty of power—with totally silent operation, low emissions and more range. GET UP TO 5X CLOSER TO YOUR PREY: Gas vehicles create a 30,000-sq-ft field of disturbance with noise and exhaust. A noise-free, emission-free Recoil lets you get up to 85% closer. SUSPENSION & HANDLING: Start with full-time 4WD, then upgrade to four-wheel independent suspension with Recoil iS. FOUR-WHEEL INDEPENDENT SUSPENSION: Upgrade to Recoil iS for a suspension system that effortlessly conquers the most challenging terrain. HAULING & STORAGE: World-class engineering and a 12-month warranty give you plenty to count on with Recoil. RELIABILITY: Tow up to 1,000 lb.—and pack another 500 in the bed—with Recoil.